Selecting wedding rings for your wedding is a fun and important activity. There are so many options on offer - diamond wedding rings, antique and vintage rings, platinum rings and wedding ring sets. And if you are looking for something different, a unique wedding ring will not be easy to find. Here are some tips on how you can find a unique ring just for your loved one. Many people think that the best wedding ring is a diamond ring, with a big gem. Surely, this is classic and will never go out of fashion, but a diamond wedding ring will cost you a small fortune, especially if you buy it on credit and going to pay for it months after your wedding. First advice is that you should shop for wedding rings as a couple. This way each of you can find the ring that they like. If you are going to wear your ring all the time, consider practical matters. The material should be durable, and the design should be universal - something that will complement most of your cloth. When most people think about buying a wedding ring, they picture going to the jeweler and ordering a ring that is already made. However, you can actually buy your diamond separately, and have it mounted later. What are the advantages? First is the cost, a loose diamond will cost you much less than the one already in the ring. Second, you will find great variety of loose diamonds in different shapes. Shape of your diamond should complement the shape of your fiancée hands. While most popular shapes are round and princess, you can also find oval, heart and marquise shaped diamonds. For example, if her fingers are long and narrow an oval shaped diamond will be better than the round one. This will help you to create a unique ring. What can make your ring completely unique is the color of the diamond. Most diamonds are clear, but did you know that you can get them in other colors? Pink and blue diamonds are very beautiful but rare, yellow diamonds are the most popular of colored diamonds. Most colored diamonds on the market are artificially treated to give them color. Especially the ones with intense color. There is nothing wrong with this technique, but don't the jewelers make you believe that this is the natural color of your diamond. Naturally colored diamonds are very, very rare and they cost much more than the clear ones. After you found you diamond, another consideration is the metal. 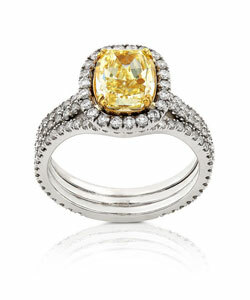 Most popular choice is yellow gold, but you can also get rings made of white gold, platinum or titanium. Traditional yellow gold is not terribly unique, and also gold is a soft material. Especially if you go for high quality 22 or 24 carat gold, it will get scratches with everyday wear. Platinum wedding rings are more expensive, but they are much more durable materials. 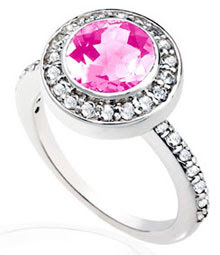 White metal ring would go with most outfits, which is important for a ring that you wear every day. Also if you want a modern looking, not vintage ring, than you should definitely go with platinum. Titanium ring is also an alternative, titanium is durable and costs much less than platinum. To find yourself a truly unique wedding ring, you will have to shop around and possibly get your diamond first and have your ring custom made. Look at what styles are there; see what you like the most, than it would be easy to select the perfect wedding ring for you.